This property reopened early this year after a refurbishment and the addition of a Nyara Spa. There are three flexible function rooms that offer wi-fi, or there is the Karnak Ballroom for larger events, which can host 340 for a reception. This is the only facility of its kind and size on the Red Sea, minutes from Marsa Alam airport and three of Port Ghalib's five-star hotels. It has 6,000m2 of exhibition space and receptions of up to 1,500 people are possible in the ballroom. There are 20 break-out rooms on offer. Opened in 2008, this five-star property offers 178 rooms and nine meeting spaces for up to 55. By 2010, the ballroom will be able to host 1,300. It overlooks the Pyramids and Dream Park - the biggest theme park in Egypt and the Middle East. Set to open in late 2009, this five-star property is on the beach at Montaza and comprises 220 deluxe villas, with restaurants and a clubhouse. The villas are set around an outdoor pool, and the beachfront location is perfect for incentives. This four-star resort offers 351 rooms set against the hills of the Gulf of Aqaba. As well as restaurants and bars, the resort has its own amphitheatre and meeting and conference facilities for up to 500 delegates. There is also a day spa and private beach. This is probably the most impressive of the resort's new hotels, offering 309 rooms and the first Six Senses Spa in Egypt. It has landscaped gardens and water pavilions, and backs onto a saltwater lagoon. There are 25 meeting rooms, the largest of which can hold 1,600 delegates. 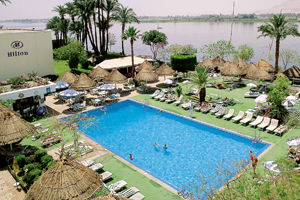 Egypt: Back in vogue as an incentive destination?